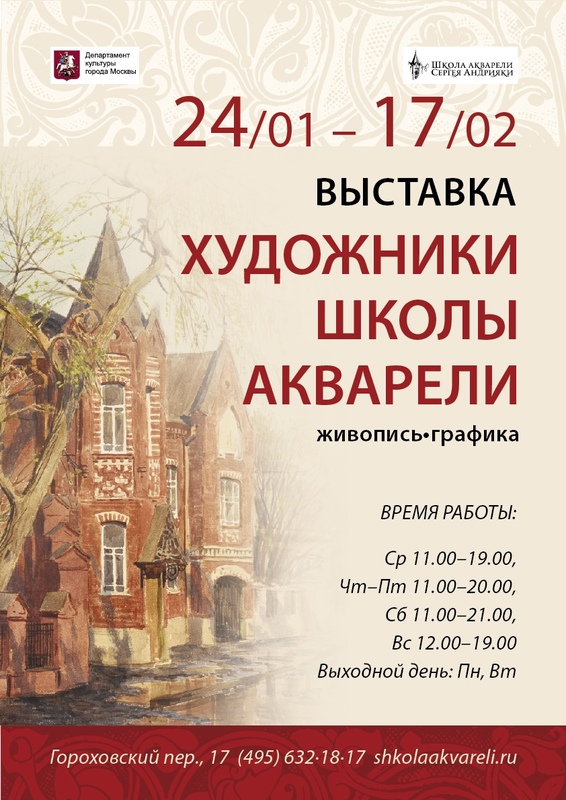 From January 24 to February 17 in the museum and exhibition complex of the School of Watercolors by Sergei Andriyaka, an exhibition of artists-teachers “Artists of the School of Watercolors. Painting, graphics. Alexander Volkov, Sergey Kotov, Sergey Chernyshev and many others. They revived an amazing and diverse world, an almost forgotten technique of classic multi-layered watercolor, with its inexhaustible pictorial possibilities. Each of them is a real find in modern painting, which has its own unique handwriting and author’s style! The paintings of the artists of the School fascinate with their genuine beauty the exquisite art of owning watercolor. The exhibition presents the best works of different genres: landscapes, still lifes, portraits, interiors and much more. The school of watercolor by Sergei Andriyaka with the museum and exhibition complex opened in 1999 with the support of the Government of Moscow. The head of this educational institution became the People’s Artist of Russia, the Full Member of the Russian Academy of Arts - Sergey Nikolaevich Andriyaka.